As the backbone of web security, secure sockets layer (SSL) technology is a must for securing sensitive data passing over the Internet — whether that's e-commerce traffic, remote access to internal servers, or other secure communications. 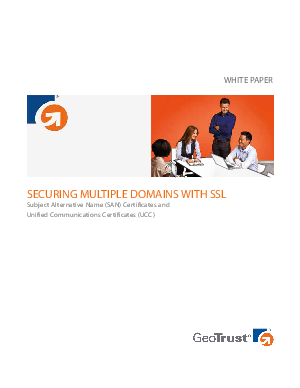 Usually, one SSL certificate secures just one domain name or URL; however, some common situations are better handled with a type of certificate that allows multiple domains to be secured with just one certificate. Read this guide to learn about typical situations where multiple domain certificates are the ideal solution, how multiple domain certificates work, and how to select the right multi-domain certificate for your needs.